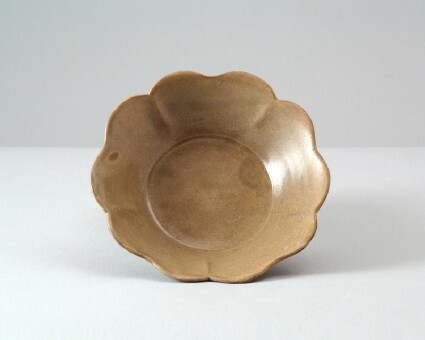 The shallow flower-shaped bowl has rounded sides with five indents on the outside, and a flared mallow-shaped rim, cut into five double lobes. The flat centre inside is clearly marked, and the underside flattened, without a separate foot. The piece is undecorated and fully covered with a partly degraded, yellowish-green glaze, and was supported in the firing on a ring of bar-shaped supports, which left marks on the glazed base.